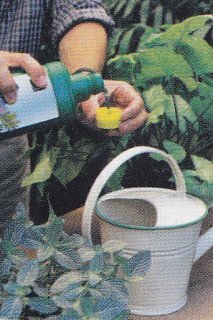 Liquid Feeds for your Garden Plants. Plants in planters or windowboxes need to be fed more regularly than plants growing in your garden. The reason is that planters and window boxes are watered more so the nutrients are washed out of the plant medium. Liquid fertilizers is a way to provide needed plant nutrients for plants in planters or in your garden. Liquid fertilizers release their nutrients faster than organic dry fertilizers, so plants suffering from nutrient deficiencies can receive the nutrients they need immediately. Organic liquid plant fertilizers are easy to use and easy to make, or purchase synthetic liquid fertilizers. A good rule of thumb for most plants is to mix a balanced dry fertilizer into the soil under your plants when planting them in your planter and then use a liquid fertilizer when necessary afterwards. Most liquid or water-soluble fertilizers are from chemical sources, but some organic types are made from fish by-products and seaweed. Liquid fertilizers dissolve quickly in warm water and are used for foliar feeding and drenching the soil around the plants. Bulky organic material is the lifeblood of any soil and must be replace regularly, whether it is applied as manure, garden compost or green manure. By improving the stucture and water content of the soil, it encourages root growth and increases a plants uptake of nutrients from the soil. At the same time, earth worms and microrganisms in the soil digest the organic matter into the humus, slowly releasing nutrients in the process, which plant roots can draw on over time as they need them. 20% phosphorus, 20% potassium) and use it at half strength (10-10-10) during the early part of the season when the plant is growing roots, leaves and stems. At mid-season you can switch to a 15-30-15 or even to a 5-10-10, with more phosphorous and less nitrogen to encourage flower and fruit production. 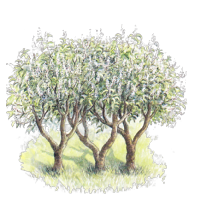 Much depends on the type of plants being grown and the needs of each particular plant.